While I don’t really think chemical photography is going completely extinct, the idea of it was kind of alarming to me. Whenever an older, simpler technology is replaced by a newer, more complex one, the people who use it always seem to be less in touch with what makes things work in their daily lives. Think of cars, for instance. Thirty years ago it was not very difficult to work on your own car if you were inclined; now they are full of electronics that are beyond the comprehension of the average grease monkey and his tool chest. Airbags, engine computers, etc. With photography it’s even worse. I’m an electrical engineer, so I have a basic understanding of how a digital camera works. But I have no detail knowledge of how the microcircuitry of your new Nikon works. How much do you know about it? If I gave you the raw materials could you build one from scratch? Of course, not; building these machines requires an electronics industrial base and teams of engineers. The best photographer for the most famous magazine likely has little knowledge of how his best camera or his software works. He has no need, of course, but for curious geeks like myself that will never be good enough! The way to sooth my mind was to prove that even if digital finally kills the film industry, do-it-yourself photography will live on in the spirit of those 19th Century photographers who existed without a photo industrial base to supply them. 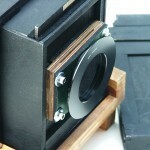 I would build my own, and make own glass and metal plate photos. 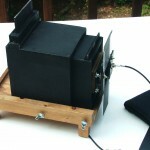 This camera is a home-made 4″ by 5″ format view camera, known as a “sliding box” camera, since the front and back body halves slide together like a telescope in order to focus. 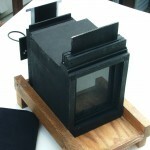 It’s made of basswood, with a pine base, and the negative carriers are each built to handle two sheets of film or one glass plate. The front of the body can rise a couple of inches for perspective control, and the lens assembly can be replaced with a screwdriver. Pictured here is my homemade 150mm lens assembly with my self-designed guillotine shutter, which is adjustable for speed and has a “bulb” mode. 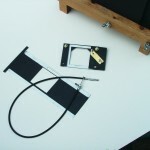 Aperture is controlled by sliding stops into the slot in the lens assembly. The stops are made of cardboard or aluminum with holes cut in them. 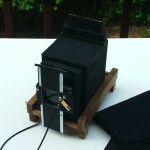 I also have a pinhole lens and can use standard view camera lenses. For it’s size it’s fairly lightweight, but it’s bulky as with any view camera. 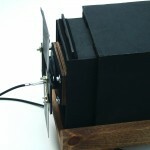 This camera has been a really fun project and has produced some nice images. There is a certain amount of satisfaction in producing really nice photos with self-made gear that can’t be achieved any other way.